Profound scripture meditations before each decade, scripture passages before each Hail Mary and inspired scriptural chants composed by Janis (after each decade) that correspond to the sorrowful mysteries. 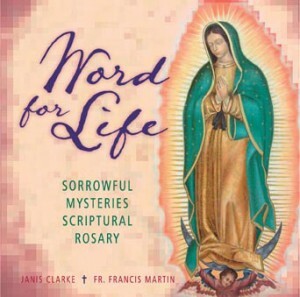 A classical rendition of Salve Regina and a song of love to the Holy Trinity, composed by Janis Clarke and performed at the International Eucharistic Congress of 2008, to conclude the rosary. An invitation to accompany Jesus, console him, and be consoled by him through the events of his passion, beginning with his agony in the garden and culminating in his crucifixion.